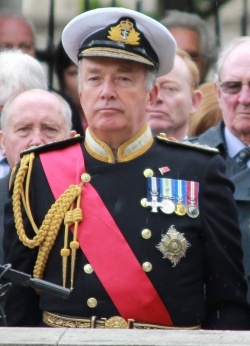 Admiral Alan William John West, Lord West of Spithead (born 21 April 1948) is a British Labour Party life peer. He joined the House of Lords in July 2007. He is a former First Sea Lord (the head of the British navy). West was parliamentary under-secretary of state, security and counter-terrorism, at the UK Home Office from 2007 until May 2010. He also headed the National Security Forum at the Cabinet Office from 2007-10. West was previously chairman of arms firm QinetiQ until 2007. He currently lists his paid business interests as chairman of Spearfish Maritime Security Limited and non-executive director of cyber forensics firm MCM Solutions. From 1989 to 1992, West ran naval intelligence for the Ministry of Defence and co-ordinated operations during the first Gulf War. He was chief of Defence Intelligence and deputy chairman of the Joint Intelligence Committee from 1997-2001. The period under his leadership covered the strikes against Iraq, the conflict in Kosovo and operations in Sierra Leone. Chairman of the advisory board of QinetiQ from 2006 to 2007. The prime minister's Advisory Committee on Business Appointments approved the role under the terms that, "In view of the time that has elapsed since he left post of First Sea Lord, approved subject to the condition that, for 12 months from his last day in post, he should not be personally involved in lobbying the MOD in connection with any current contracts or existing or new bids for work". Member of the International Business Advisory Board of HSBC from September 2010 to September 2011 . ACOBA saw "no reason why he should not accept the appointment forthwith, subject to the condition that, for 12 months from his last day in office, he should not become personally involved in lobbying UK Government Ministers or Crown servants, including Special Advisers, on behalf of his new employer." ↑ Profile: Alan West, BBC News Online, 8 July 2007. ↑  UK Parliament Biographies, Lord West of Spithead, accessed 08 September 2016. ↑  Wiki OpenRights Group, Lord West of Spithead, Accessed 8 September 2016. ↑ Political Council members, Henry Jackson Society], accessed 5 November 2014. ↑  Wiki OpenRights Group, Lord West of Spithead, Accessed September 8 2016. This page was last modified on 23 March 2018, at 03:41.